Hayes Plantation is a farm in Chowan County, across Queen Anne's Creek from Edenton. The plantation is known chiefly as the seat of the Johnston family. Samuel Johnston (1733-1816) purchased Hayes in 1765 from David Rieusett and made it his family's home until 1793, when he moved to the Hermitage, a plantation in Martin County. In 1814 Samuel Johnston gave Hayes to his son, James Cathcart Johnston (1782-1865). With the help of the English architect-builder William Nichols, James Cathcart Johnston built a new plantation house at Hayes, and he and his three sisters returned there to live in 1817. The plantation remained in the Johnston family until James Cathcart Johnston's death. In his will, Johnston left all his Chowan County property, including Hayes, to a business associate, Edward Wood. The Wood family continues to operate Hayes as a working farm. The plantation that Samuel Johnston purchased contained 543 acres. It grew modestly during his lifetime to 665 acres, but dramatic growth occurred under the ownership of his son James Cathcart Johnston. The younger Johnston was an energetic manager of his estates, keenly interested in agricultural innovations. He acquired and cleared additional land, so that by 1860 the plantation encompassed 1,374 acres. Corn was the principal crop grown in the antebellum era, but Johnston planted other grains as well and raised livestock. James Cathcart Johnston also inherited a substantial collection of books from his father. To house those books, he built a special wing for the library in the new plantation house at Hayes. The octagonal, Gothic library is one of many distinctive features of the stately structure. 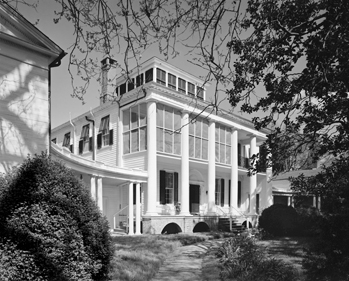 The house, still in use as a private residence, is considered one of the finest antebellum houses in North Carolina. A reproduction of the library, which includes many of the original books and furnishings from the Hayes house, is on display in Wilson Library at the University of North Carolina at Chapel Hill. Catherine W. Bishir, "Severe Survitude to House Building: The Construction of Hayes Plantation House, 1814-1817," NCHR 68 (October 1991). Is there any documentation as to how the plantation became known as "Hayes Plantation?" I am descended from the Hays/Hayes line and they settled in that area in the late 1600's/early 1700's. I was just wondering if there is any connection to my family. Large homes like this were generally named by one of the family's that owned it. When it becamed named as "Hayes" is not known to me, but a search of land records might be able to clear that up. I assume the plantation was built and operated by slave labor. A mention of slaves might be appropriate . Thank you for visiting NPpedia and taking time to share this. Hayes Plantation was operated by slave labor. I will investigate adding an update to this entry.